Found on the Mobile Web is a weekly WAP Review feature listing newly added and updated sites on the YesWAP.com mobile portal and WapReview mobile site directory. With these latest additions the directory and portal now list 2236 mobile sites. Stripr dbelement.com/stripr/ View your favorite daily comics in your mobile browser with Stripr. 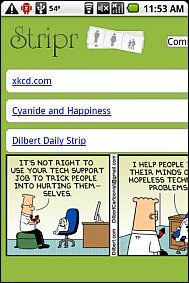 You can customize your Stripr by choosing from over 150 different strips including geek classics like xkcd, Dilbert and Apple Geeks as well as mainstream comics and some really obscure ones. The comics are pulled from user submitted RSS feeds and not all of them work. Check the user ratings which are a good guide to which ones are functional. Billed as an iPhone webapp, Stripr also works well with the Android browser and Opera Mini. You do have to register to use Stripr but registration is free and only requires an email address. Although the web reader is slick, the actual content is disappointing promotional as only the first chapter of each manga is available. It’s a shame that there’s no way to read the full manga’s on the non-iPhones devices that the reader works so well on. BollywoodJalwa www.bollywoodjalwa.com An eclectic mobile portal offering Bollywood news and reviews, cricket scores and news, free ringtone, wallpaper and game downloads and a page of mobile handset tips and tricks. iCurrent m.icurrent.com A personalized news aggregator. Registered users can customize their iCurrent homepage by choosing from a variety of pre-configured channels such as Financial Reform, HTML5, World Series of Poker, Net Neutrality or Search Engine Marketing or by adding their own search queries to create a new channel. 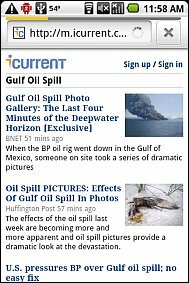 Anyone can use iCurrent as a news search engine or meme tracker without registering or logging in. AndroLib m.androlib.com An independent front end to the Android Market. Browse and search the Market using a responsive and lightweight web interface instead of the sometimes problematic Market App. Usability suffers as there doesn’t seem to be any way to download and install apps from within AndroLib. Listings include all the information you normally see in the Market including ratings, reviews and permissions plus some additional items that aren’t shown in Market listings like the app’s file size, package name and estimated number of downloads to date. 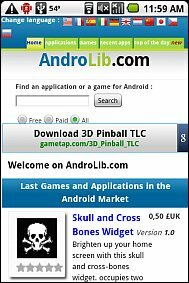 AndroLib’s browser detection is a bit flaky, often redirecting non-Android mobile browsers to the desktop site even when the user explicitly specifies the m.androlib.com mobile URL. 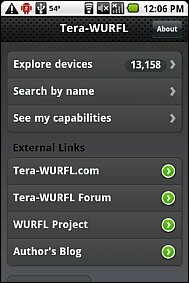 Tera-WURFL Explorer www.tera-wurfl.com/explore/mobile_skins/iPhone/ is a mobile (or at least iPhone) friendly webapp for searching and browsing the WURFL mobile device information repository. It lets you look up a handset by make and model to view a comprehensive listing of the device’s capabilities including display resolution, supported doctypes, Java ME features, image, audio and video formats and much more. Geo SMS servletsuite.com/geosms/ A mobile HTML5 webapp that lets you create text messages that include your location, as either latitude and longitude or a link to a Google map. Works on the iPhone, Android and other devices with Location Provider API support. Messages are sent from your phone by using the sms: URI scheme to invoke the phone’s Messages app with the message body pre-filled with your text and location information. 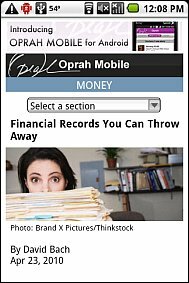 Oprah Mobile m.oprah.com Oprah’s mobile site offers recent stories from Oprah.com on Health, Style, Relationships, Home & Garden, Food, Entertainment and Money. The image heavy articles are aggressively paginated which makes them readable on low end devices but a chore to navigate on smartphones. KBR Heritage CU Houston nbp1.cunetbranch.com/kbrfcu/MB_Login.aspx Mobile account access for members of Houston’s KBR Heritage Federal Credit Union. KBR uses Fiserv’s Mobile Money hosted mobile banking product to provide this service. CTA Bus Tracker ctabustracker.com/bustime/wireless/html/home.jsp A mobile optimized, text only version of the Chicago Transit Authority’s real-time bus tracker. Drill down through the wizard style menus to select your route, direction and bus stop and the tracker will display the estimated wait time for the next bus. 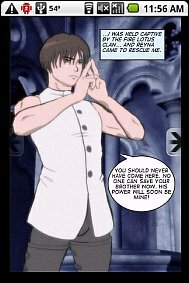 This entry was posted in Found on the Mobile Web and tagged Comics, FOMW, manga, Oprah, Transit by Dennis Bournique. Bookmark the permalink.